Featured above: Diatoms, as seen through a microscope; or, silicon under silicon. Long-Solved Mysteries: Old windows — like, really old ones, from the Middle Ages — are sometimes thicker at the bottom than the top, and a popular explanation is that glass is actually a slowly moving liquid. Given a couple thousand more years, the window panes might just slough off the wall entirely! Is this true? Of course not. Glass is a noncrystalline amorphous solid, remember? The short explanation is that these windows were subject to gravity when they actually were in a flow state — i.e., when they were being created — which caused them to thicken up near the bottom. Scientific American has a more thorough explanation for the curious. 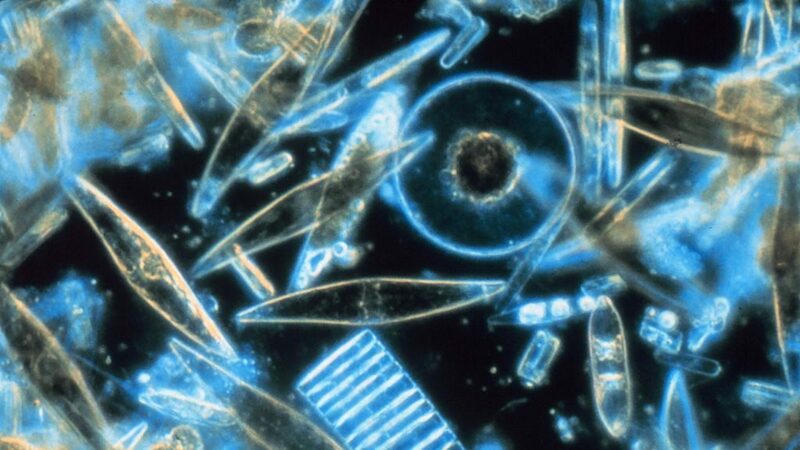 Fossil Cruel: Diatoms tend to leave their single-celled bodies behind after they die, sometimes en masse. There are locations on Earth where their bodies pile up hundreds of meters deep, leaving behind what’s known as “Diatomaceous Earth.” It has a number of interesting properties that make it useful, for instance, as a physical water filter, but it’s probably best known as a human- and pet-safe way to go after bugs. At scales that we and our furry friends operate, it just feels a little grainy, but at a bug’s size, it’s more like a bunch of needles that will pierce their exoskeleton and leave them desiccated. Silicon’t: I mentioned that any silicon-based life would exhale silicon dioxide, which would be problematic at room temperature. Incidentally, if we breathe silicon, it’s just as bad. It’s actually not toxic, in a technical sense, but small enough granules of silicon can be taken up by the lungs and cause disease in a manner very similar to berylliosis. So, try not to! The Real Chauvinist Is This Great Man: “Carbon Chauvinism” is a term invented by Carl Sagan, lest anyone think that’s an original idea of my own. He proudly declared himself such a chauvinist in his television series Cosmos. The Fires Within: Here is the Arthur C. Clarke story promised in the episode, in both text and audio format. You can read it freely on Google Books, or listen to this video here. Please note that, despite what the video’s cover image says, his last name is spelled “Clarke.” But it’s a pretty decent reading! Fable Finished: Either the paperclip example or The Unfinished Fable Of The Sparrows might strike you as patently absurd and not worth worrying about. Especially if that’s your reaction, it’s very worth picking up Superintelligence from your local library and giving it a read. Bostrum is not some manic street preacher — he’s given this a lot of thought, and he’s a very smart fellow. The book can get a little heady sometimes, but it’s still pretty accessible for the casual reader. Silicon is one of the most abundant elements on Earth, accounting for over a quarter of the crust by mass.1 So it didn’t take long for early humans to find some and try to put it to good use. As silicon dioxide, or silica, element 14 is most commonly found as sand. But it also appears as quartz, flint, amethyst, agate, and other stones. One of humanity’s earliest discoveries was that flint rocks could be chipped to create a sharp edge, providing the means to make hand axes, spear tips, knives, and drills. Beyond blades, flint could be struck against iron to create sparks, allowing humans to harness the heat and light of fire as needed. All the earliest human civilizations were built using tools made of silicon. The Stone Age, of course, is far behind us. But as humanity has endured, we’ve continued to invent world-changing technology out of silicon. Today, we’re putting silicon under the microscope. Stone tools might have been the first use for silica, but we soon found even better applications. Bricks, tile, and cement all include silica as a main ingredient at least some of the time. These have all been critical materials in building human society, both figuratively and literally. But something truly revolutionary happened when humans discovered how to turn silica into glass. You’re familiar with glass. It’s that stuff windows and bottles are made of. Chemically speaking, it’s a noncrystalline amorphous solid. In other words, it doesn’t exhibit the ordered structure that something like a cubic crystal of table salt does. Glass is an extremely versatile substance. It can be cast or fused, blown or ground, and it’s almost entirely chemically inert. Even before alchemists started working with hazardous acids, that inertness was valuable for holding wine, vinegar, and other reactive substances. Some glasses form naturally, like obsidian, but the craft of glassmaking was probably discovered accidentally by prehistoric people working with ceramics, metals, or other industries dealing with very high temperatures. By exposing sand to this extreme heat, it would melt, then cool as a colorful, shiny solid. Although we tend to think of glass as categorically transparent, it’s important to note that this was not the case for much of history. Various contaminants, added inadvertently or intentionally during the melting process, would lend different colors to the final product, but rarely was it something that could actually transmit light. But glass was nonetheless admired for its aforementioned chemical properties and cheap price, especially compared to ceramics. Glassmakers in Alexandria finally figured out how to manufacture clear glass around 100 CE, and the Roman Empire started incorporating it into its architecture — namely, as windows. They weren’t exactly like the windows we have today, but they were good enough to let light come in and keep bad weather out. Italians spent the next millennium improving their glassmaking techniques. Strangely, other civilizations didn’t seem to have the same interest in these skills — or maybe they simply weren’t allowed to learn. By the 13th century, Venice was the world leader in glass production, both in terms of quantity and quality. And the methods those artisans used were a highly protected secret. Venetian glassmakers held a privileged position in their society, but they weren’t exactly free. A law passed in 1291 required that all glassmaking had to happen outside of the main city, on the island of Murano. Ostensibly this was to keep the fiery furnaces away from the wooden buildings of the densely populated city, but many historians believe the ulterior motive was to keep the trade away from prying eyes. Four years later, another law was passed that forbade glassmakers from leaving the city limits, so this seems like a pretty reasonable theory. This monopoly on the craft meant that Italians had access to a material of higher quality than anyone else on Earth, so it’s not too surprising that the first known prescription eyeglasses were invented right in Venice. Germany and the Netherlands soon became famous for grinding glass lenses of high quality as well, where craftsmen discovered how to create lenses that could make very small things appear very large, and very distant things appear very near. Both the microscope and the telescope were invented in the Netherlands around the turn of the 17th century. These two tools alone created entire fields of study where none had existed before. Scientists like Galileo Galilei made new discoveries about a night sky that had appeared the same for thousands of years, and the germ theory of disease could only be postulated after the microscope rendered visible organisms that were previously far too small to see. By 1705, Isaac Newton turned the field of optics upside-down with little more than a glass prism. Flasks, beakers, barometers, thermometers, and many more instruments of science couldn’t exist without transparent glass. And glass is a material that refuses to be made as obsolete as flint. The light bulb, camera, solar panel, and television are inexorably linked to glass, and despite the prevalence of plastic, odds are good that your cell phone’s screen is made of glass, too. 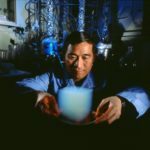 If anything, noncrystalline amorphous solids are one of the most exciting frontiers of materials science in the 21st century: Self-cleaning glass, color-changing glass, and flexible, paper-thin glass are all poised to create exciting new tools and playthings in the near future. From scientific instruments to window panes to fire starters, if it weren’t for silicon, we would, in more than one sense, be left in the dark. We humans are not the only species to employ silicon. Plants readily absorb the element from the soil, and infamous stinging nettles are tiny hypodermic needles made of silica. Some sea sponges build internal biological structures out of silica, in the same way that our skeletons are made of calcium. The diatom is a particularly strange marine microorganism. Neither plant nor animal, diatoms collect energy via photosynthesis, but process chemicals like an animal’s liver, and also use appendages to move around. And, uniquely, their entire bodies are contained within a single cell wall made of silicon dioxide. But it’s possible that there exists a form of life that’s even more intimately entwined with element 14 — maybe on Earth, or maybe among the stars. We’ve established that elements that share a group, or column of the periodic table, often behave in similar ways. The explosive properties of both lithium and sodium are probably the best example we’ve seen so far. So it should come as no surprise that silicon has a lot in common with its upstairs neighbor, carbon. Both elements are tetravalent — that is, they each have four electrons in their valence shell. That’s the property that allows carbon to so easily form the nearly infinite kinds of molecules necessary for the complex chemistry of life. But of course, it’s not quite so simple in real life. Compared to carbon, silicon is a big atom. It’s more than twice as heavy, and its four valence electrons occupy a shell that’s farther away from the nucleus than carbon’s. This makes silicon’s bonds much weaker than carbon’s, so silicon compounds are not as stable. They have trouble forming molecules as complex as organic compounds. If silicon-based life forms had processes analogous to respiring and metabolizing sugars, they’d run into further problems, as well. We carbon-based animals inhale oxygen and exhale CO2. If a silicon-based animal were to inhale oxygen, they would need to exhale SiO2… AKA, silica. For every breath they inhaled, they’d need to exhale a lung full of sand. But perhaps we are simply being carbon chauvinists. Silicon bonds are more stable at high temperatures, and SiO2 can be gaseous at temperatures north of 2100 degrees Celsius. It’s entirely possible that silicon-based life would be so foreign to us that we simply don’t know how to look for it — even if it’s right under our noses. Theoretically, we could be oblivious to an entire ecosystem of silicon life on Earth’s surface — or far below it. The idea is called a Shadow Biosphere, and this idea is at the heart of The Fires Within, a 1947 short story by science fiction legend Arthur C. Clarke. It’s a really short read, with kind of a cute twist at the end. I’ll make it available for you to read or listen to at episodic table dot com slash S I.
Fiction aside, no known silicon based life exists, either on Earth or anywhere else. Currently, our most promising leads for extraterrestrial life exist on Saturn’s moon Titan and Jupiter’s moon Europa, where lakes and oceans made of hydrocarbons and liquid water might be hospitable for the kinds of life we’re already familiar with. Of course, this is all assuming that we’re limiting our definition of life to the biological. But if you’re a little flexible with your definitions, another kind of silicon-based life form is just over the horizon. We have so far avoided discussing what’s probably the most famous technological application of element 14. After all, Silicon Valley isn’t renowned for its glassware. Yes, we’re finally tackling the subject of semiconductors. Like boron, silicon is a metalloid. In pure form, it has a shiny, metallic appearance, but it’s quite brittle, and far from ductile. It also doesn’t conduct electricity very well… most of the time. At very high purities, with traaace amounts of elements like boron or arsenic added, silicon can learn some very useful tricks, like passing electrical current in only one direction, or exhibiting variable resistance. It’s these excellent electrical properties that make silicon the most useful element in the production of electronics like computer processors. But it’s not the first element that was used in computer chips. The tasks performed by silicon were originally done by vacuum tubes. They can can also pass current in one direction only, but they have the disadvantage of being made of fragile glass, and even the smallest ones are about as big as your fist. Silicon was not even used in the first electronic transistors. Silicon might be plentiful, and possess ideal properties, but germanium is easier to work with. So much so that the first decade of semiconductor technology was entirely built with germanium. Silicon would hav- better results, but it was too difficult to purify. A speaker at the 1954 Institute of Radio Engineers National Conference actually gave a fairly dour, and by all accounts very boring, presentation to this effect, explaining just how impractical it would be to build a semiconductor device using silicon. Of course they were. And Teal had come prepared with a presentation of evidence as extraordinary as his claim. He pulled out a record player and started playing Artie Shaw’s big band hit, Summit Ridge Drive. The phonograph was hooked up to an amp running on germanium transistors, which he slowly dipped in a container of searing hot oil. Predictably, the music ground to a halt. Teal replaced the amp with one made with silicon transistors. He set the needle down and again immersed the amp in hot oil… and the band played on. So what are we asking our computers to do that’s so much harder than going to the moon? Quite a lot, it turns out. We’re asking them to identify people by name in photographs. We’re asking them to drive our cars. We’re asking them to diagnose hospital patients and perform legal research and report the news. We’re even asking our computers to write software for other computers. And we’re asking them to perform these tasks independently. In short, we’re asking our silicon chips to act as human as possible. It’s not really a Terminator/Skynet situation that we need to be worried about — that would certainly be bad, but it’s one of the less realistic possibilities. The possible dangers are those that arise out of more benign situations. The AI might come up with some innovative new ways to create paperclips, perhaps using some new materials or in ways that are more efficient than current processes. Or it might learn to profit off the stock market so it can use that money to create more paperclips. It might learn to crash the stock market so it could profit even more — so it could manufacture many more paperclips. It might learn that all matter on Earth could potentially be turned into paperclips, including our infrastructure, our homes, and our squishy bodies. It sounds very silly when put that way, but only because this is the simplest illustration of how a single-minded superintelligence might see the world. Our hypothetical paperclip maximizer holds no ill will toward humanity. It’s simply been given a goal, and it doesn’t possess any values that might tell it, “That’s enough paperclips, leave that orphanage alone.” So you can see how giving a superintelligent AI a goal like curing cancer, or ending war, might have unintended side effects. “It could give us advice and keep an eye out for the neighborhood cat,” added a third. The flock was exhilarated, and sparrows everywhere started chirping at the top of their lungs. “There is a flaw in that plan!” squeaked Scronkfinkle; but his protests were in vain as the flock had already lifted off to start implementing the directives set out by Pastus. Just two or three sparrows remained behind. Together they began to try to work out how owls might be tamed or domesticated. They soon realized that Pastus had been right: this was an exceedingly difficult challenge, especially in the absence of an actual owl to practice on. Nevertheless they pressed on as best they could, constantly fearing that the flock might return with an owl egg before a solution to the control problem had been found. I would say that’s the end, but as mentioned, this is The Unifinished Fable Of The Sparrows. Hopefully, the humans responsible for creating electronic intelligences are not the same humans who value financial gain over any cost to other humans and the Earth at large. Of course, you don’t need to employ the assistance of a superintelligent being to add silicon to your element collection. If our prehistoric ancestors could do it, so can you! But there are some pretty cool options if you want something more exciting than sand. You could get your hands on something made of silicone — like, a heat-resistant oven mitt, or mold for chocolate. Silicones are long chains of silicon atoms, and they take many forms. The Silly Putty we discussed in episode 5 is another example. You could take this opportunity to add something truly artistic to your cabinet of elemental curiosities, as there’s no shortage of glass artists in the world. 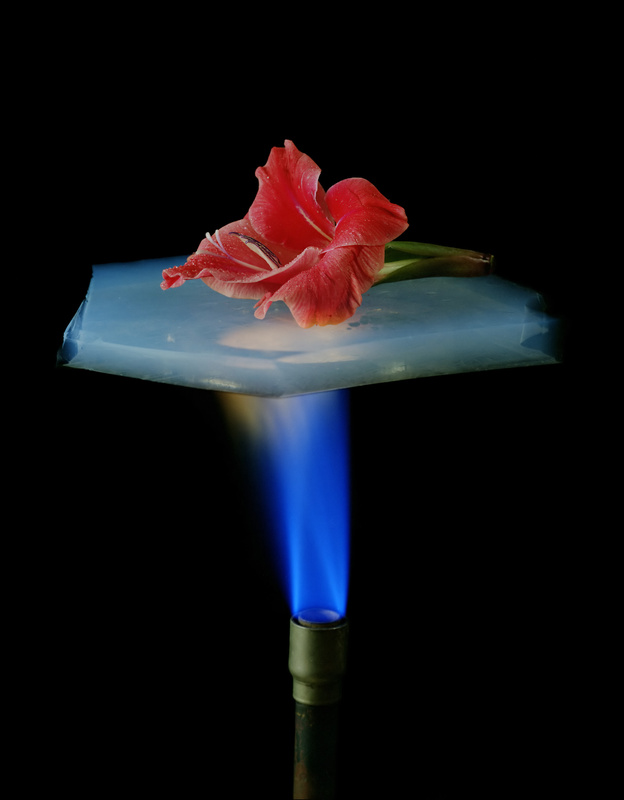 In addition to glass, silica can be made into something called aerogel, which for good reason has the nickname, “frozen smoke.” It’s an extremely effective insulator, weighs practically nothing, and all around looks like it’s not of this world. But the discerning collector will be especially pleased today. Computer chips require silicon of incredibly high purity — using the scale we learned in the helium episode, it would be grade 9.0, or, ninety-nine point nine nine nine nine nine nine nine percent pure. In other words, for every billion silicon atoms in a computer chip, there’s only one atom present that’s something else. Creating these computer chips requires industrial-scale creation of silicon crystals, which are then sliced into thin wafers. Not all of these wafers make viable computer chips, though. Some relatively high level of acceptable losses has led to something of a cottage industry for defected silicon wafers, and they can be had for a bout twenty dollars. Or you could skip the middle-man entirely, and simply harvest silicon from an old cell phone or computer parts. But if you do, just make sure you still have some sort of device you can use to download podcasts. Thanks for listening to The Episodic Table of Elements. Music is by Kai Engel. To learn whether glass is a slowly forming liquid, learn how glass can possibly clean itself, see photographs of aerogel, and play a game where you convert all matter in the universe into paperclips for fun and profit, visit episodic table dot com slash S I. Next time, we’ll meet our match with phosphorus. This is T. R. Appleton, reminding you that the word “robot” comes from a Czech word meaning “forced labor,” so let’s find something more polite to refer to our electronic friends of the future. 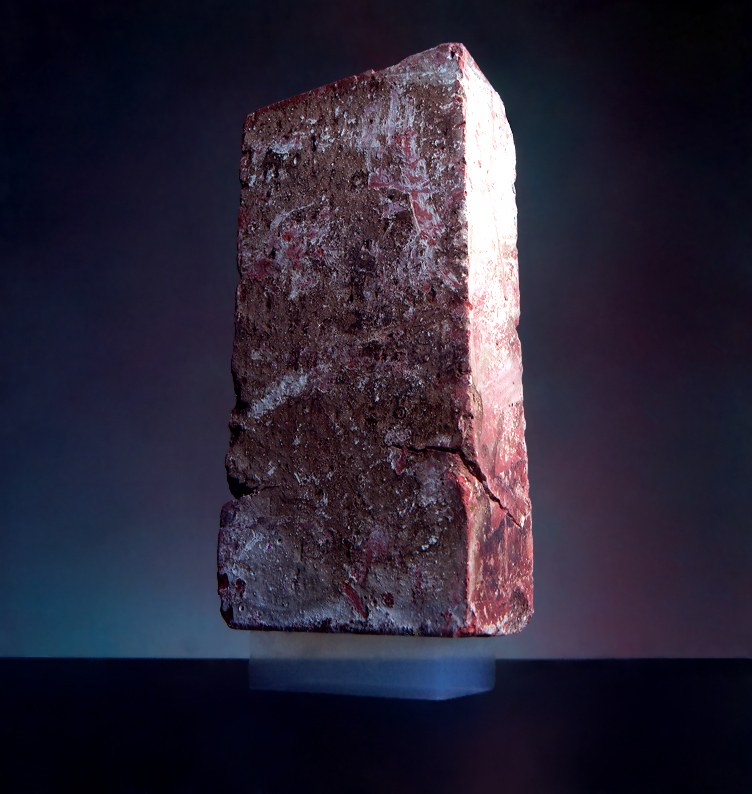 Carbon is everywhere in our bodies, but silicon has always been in our hands. Chemicool, Silicon Element Facts. Dr. Doug Stewart, October 9, 2012. Spectrum Online, The Lost History Of The Transistor. Michael Riordan, May 2004. Calculated assuming an original speed of 100mph, with 25 subsequent doublings, expressed as 100 * 2^25. Of course mathematical accuracy isn’t really the point here, but more the absurdity of scale. The Guardian, With Less Computing Power Than A Washing Machine. Popular Mechanics, How Do NASA’s Apollo Computers Stack Up To An iPhone? David Grossman, March 13, 2017. Communications Of The ACM, John McCarthy. Bertrand Meyer, October 28, 2011. Ethical Issues In Advanced Artificial Intelligence. Nick Bostrum, 2003.